5th June 1723, Kirkcaldy, Fife, Scotland. Adam Smith’s father, who was a Customs Officer, died before his birth. Local Burgh school. Glasgow University. Balliol College, Oxford. 1748: Under the patronage of Lord Kames he delivered public lectures in Edinburgh on Rhetoric and belles lettres and moral philosophy. 1750: He met the philosopher David Hume who was to become one of his closest friends. 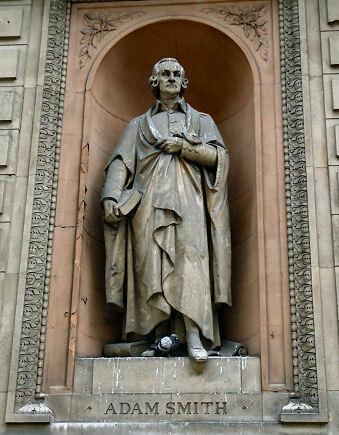 1751: Appointed Professor of Logic at Glasgow University. 1755: Smith appointed to the Chair of Moral Philosophy at Glasgow University. 1759: Published his “Theory of Moral sentiments”, based around sympathy for other people’s predicaments. 1764: Resigned Professorships to become the tutor to the Duke of Buccleugh. Traveled widely in France with the Duke, where he met D’Alembert, Voltaire and Quesnay, the Head of the Physiocratic School of French Economists who was to have a major influence on him. 1767: Elected a Fellow of the Royal Society of London. 1776: Smith published his seminal work “Inquiry into the Nature and Causes of the Wealth of Nations.” This book was the first to establish political economy as an independent subject and remains one of the most important books on economics ever written. Amongst other things it describes the theory of the “Division of Labour” whereby products are made quicker and more skillfully if they are made by a team of specialists rather than one artisan. 1776: Watched the illness and eventual death of Hume and edited some of his papers. Went to London and became a member of a club which was also frequented by Joshua Reynolds, Samuel Johnson and David Garrick. 1777: He was invited by William Pitt the Elder to be the guest of honour at a public dinner to be seated first, as he said “we are all your scholars”. 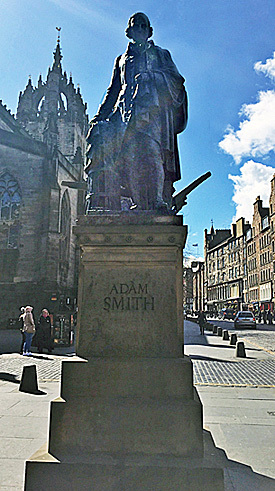 1778: Smith became Commissioner of Customs at Edinburgh until his death. Went to live with his mother. 1787: Elected Lord Rector of Glasgow University in succession to his friend Edmund Burke. 1776: “The Wealth of Nations”. 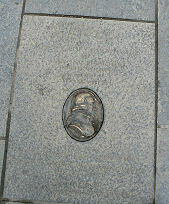 17th July 1790, Edinburgh, Scotland.